Mazda and Jota Sport have spent the last month further developing the handling and performance of the Mazda MX-5 GT race car in time for the next Britcar Dunlop Production GTN Championship race at Thruxton Circuit on 11 and 12 June 2011. Since the last race, held at Donington Park on 8 May 2011, where the team secured their second podium finish, Jota Sport has improved the rear brake package, modified the differential, added a new induction system and developed bespoke dampers. The latter will allow an increase in mid-corner speed and better feel for the driver, while the additional enhancements will provide improvements to overall performance. Combined with the lightweight, nimble and responsive handling attributes which make up the DNA of the MX-5, the GT race car will be taking the fight to the competition, aiming to beat BMW, Lotus and Ginetta at Thruxton Circuit. “Thruxton will be the fourth race of the Britcar Dunlop Production GTN Championship race series, with just three races run, the Mazda MX-5 GT car has secured second in its class in the championship and fourth overall. This is testament to its bullet proof reliability, nimble handling and lightweight. The latest modifications will make the MX-5 GT race car an even stronger contender against the more powerful race cars in its class,” comments Graeme Fudge, PR Director, Mazda UK. As part of the Motorsport programme, Mazda has developed a new Mazda MX-5 GT racing website to provide MX-5 and motorsport fans with the latest information on the 850kg MX-5 GT race car and its performance in the Britcar Dunlop Production GTN Championship race series throughout 2011. 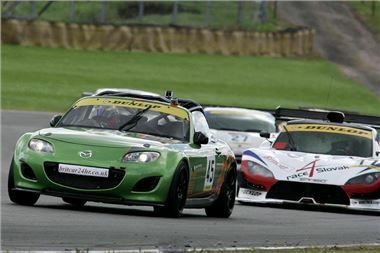 To follow the lightweight Mazda MX-5 GT race car’s performance, race results and lap times for each of the Britcar Dunlop Production GTN Championship races visit: www.mazdamx5racing.co.uk. Also available on the Mazda MX-5 GT website are; the Mazda driver diaries, race footage and images. Following each of the Britcar Dunlop Production GTN Championship races, Mazda will upload new content, including images, footage and results. The Britcar Dunlop Production GTN Championship is contested over ten races from March to November including a race at the Spa Francorchamps circuit in Belgium. The next race is at Thruxton Circuit on 11 and 12 June 2011.